you to make a difference in the world with $1 dollar using the power of three? In 2005 I was Ask this question and given several examples of people who had used this secret to accomplish great things. I think to myself I have a dollar. But what could one single dollar do to make a difference in anything maybe buy someone a soft drink. So the only way for me to make a big difference with just one dollar would be to put my dollar with someone else’s dollar and find at least 3 people each day to match my dollar who would also share with 3 others then with the power of three we could create some momentum matching dollars. But what about the other parts of the challenge, that would be tough. Definitely a challenge. Question 2. What if you had a million-dollar idea or some knowledge that could change lives of the people of the world for the better by them just having access, or making it available would you be willing to sell it for just A Single Dollar? On the Evening of Nov 9, 2005 I was given an envelope with a card enclosed. I was given a 92-day challenge to take a single dollar make it a million-dollar idea, use the power of three for sharing, and was reminded that I was only the steward of the rewards… not the owner. I never took the challenge in 2005 now 11 years later I’m ready. I have prayed and asked God to help me to find a way to make this single dollar; into a million-dollar idea that would change the world and the people lives in it for the better… This idea would have to turn this one single dollar into a “dynamic dollar”, so that it would make a major difference in the lives of many. After all, Jesus DID feed a crowd of over 5000 with just 5 loaves and 2 fishes. And… after everyone had eaten their fill, there were 12 baskets left to spare. God is a God of Abundance! I have great faith that He will make a HUGE difference with this “dynamic dollar”! I’ve always been conscious of the massive number of people in this country and around the world who have been burdened with addiction of some kind. Fortunately, and very gratefully, I have not been one of those people, yet this has been something that has been on my heart for a very long time. I want to help people with addiction, and have the funding to offer care for free. Addiction is the #1 problem with people spanning the globe. So after 11 years I have decided to take the challenge. My first Goal of the challenge was the 1 single dollar. I had that. Next part of the challenge was to come up with a million-dollar idea that I would be willing to sell for 1 single dollar, and the idea had to change the lives of the people for the better. The third part of the challenge was to use the power of three and to keep this challenge up for 92 days to see how many people bought my million-dollar idea for one single dollar. My Million-Dollar idea is based around the laws of positivity, and the positivity factor. My Million Dollar idea is not even a secret in fact I was shocked when I had my wake up moment and realized there is nothing to be discovered it was always something that had to be uncovered in the hollowed spaces of our minds. Some years ago I uncovered the blocks of negativity that was inhabiting some of the storage containers in my brain. I never consciously knew these thoughts were running in the background of my mind. But there they were plain as day just unknown to me. They were covered over with beliefs, pains, hurts and all kinds of very low energy feelings that kept me in the depths of despair laced with a glimmer of hope. I decided to start uncovering whatever was there and bring it out in the open because the life I was living was filled with failed relationships, I often would take two steps forward and one step back. I would make some strides but they seldom covered my expenses, struggle was part of my day to day existence and I was sick of it. I put myself in a self-imposed Master-mindset 92-day cleanse. I heard one time that we can convince ourselves to do anything for a short amount of time that we could never convince ourselves of long term. For 92 days I eliminated any negative thoughts I had but the way I did it was just focusing on the positive. Positive self-talk, positive affirmations, positive books, anything positive I was devouring it with an appetite for Knew-knowledge and the more I woke up the more I realized how asleep I had been. In 2002 I started my first annual Master-mindset Cleanse. Now on October 1st until December 31st I do my 92-day Master-mindset Cleanse and this year I invite you to come and join me. I always want to start the new year off when a positive mindset. The first year I did the cleanse I went from $56 in my bank account to having $10,000 within two weeks, the next year I was in a successful relationship and within two years happily married and building our dream home worth over a million dollars. And it is no secret, but until you expose it, and impose positivity directly into your think tank your life will stay the same maybe get a little better or a lot worse, but one thing for sure if you were living your dreams, making your goals, have everything you desire you probably would not be this far into the information. 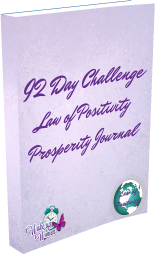 Since I’m starting the 92-days Law of Positivity prosperity challenge I’m compiling the journal for you that I use each year. For 92 days starting October 1 until December 31 In your journal you will have a positive message along with a little daily wisdom tip at the top of the page and rooms for you to write every day in your Hello Journal, your positive affirmation that you speak into reality. Wisdom Tip: Don’t forget we have 50 thousand thoughts each day. If only 4500 of those thoughts are positive, then you can’t build a positive life from a negative foundation. Uncovering these foundation flaws in our hidden agenda’s lets you reveal where the real blocks are currently being held in your mind. During this 92-day challenge, be aware of the abundance in your life. BE aware of the wonder around you and all the blessings that you have been given. I am blessed with supportive people and an incredible group of friends and family. I have many things that much of the world does not… a home, a car, clothing, shoes, and lots more, that many of us take for granted in our day to day lives. I have also been gifted with many talents. I am humbled and oh, so grateful to be using those God given talents to make a difference for others. I believe we have all been given different gifts and talents, and when we put them together, with God’s help, we create abundant blessings for others. Gratitude pays it forward. “It is in giving that we receive”, as St Francis of Assisi says so well, in his popular prayer. Normally this Journal would sell for around $37.97 but for the Challenge it will only cost you $1. One single dollar. We take 100% of the net proceeds from the purchase of your journal which will be delivered Via your e-mail. We have a vision to pay forward this one dollar, along with the one dollars from the sale of other journals, to make a big dent in the addiction problems of this world. Thank you for helping make that difference. Did you know that If I share with three people who share with three people who share with three others that in 14 days that is over 1.5 million people which is over 1.5 million dollars raised for addiction treatment. Imagine how many that would be if we continued to do this for 92 days. I actually added it up. It is 2.618339e+43… However much that it. A wealthy man entrusts his wealth to his servants while he goes on a long journey. One is given 5 bags of gold, another 2 bags and a third is given 1 bag, each according to his ability. The first 2 men put the money to work and each doubled what they had been entrusted with. The third man, who had received one bag dug a hole and hid his master’s money. The third man told his master that he knew the master was a hard man, harvesting where he had not sown and gathering where he had not scattered seed. He was afraid so he dug a hole and hid the gold in the ground. He handed him back exactly what the man had given him.. one bag of gold saying, “Here is what belongs to you”. The master called the servant wicked and lazy telling him he should have at least put the gold in the bank and gained interest. He took the one bag from him and gave it to the man with 10 bags. I have enlisted Wake Up Women Dynamic Women Live, to partner with a variety of people and organizations throughout the country who will make sure that we meet and exceed the challenge. There is power in 3! The purchase of your journal for $1 one simple dollar creates One “dynamic dollars”. Just click the button and it will take you to PayPal. With an extremely grateful heart. We thank you for being part of this heartfelt project. Thanks for purchasing your journal.